The Acceleration, or Axle, or Axe (depending in how much of a hurry you are), was a post-capitalist, accelerationist movement, zooming for the future of enhanced/uploaded selfs, and a post-singularity style cornucopia society with complete individual freedom. The Reaction, or Rax, was a, er, reaction to that. Traditionalist, modernised Anti-Modernity, with strong fascist and scientific racist undertones; trying to go back to pre-state capitalism instead of trying to go past it. They hankered for top-down control, with God on their side. One thread promising interesting developments for the future are the (now) self-aware prospecting (and other) robots, who, at least in their own eyes, have moved from being property to actual self-owned personhood - given that this is Ken MacLeod I would expect him to make more of this as part of the trilogy, and I'm very much looking forward to his thoughts, all the more so after bringing up the Lockean Proviso in the story (it's used as the name of one of the legal companies the war criminals are being employed by - to fight the robots, nevertheless). And no, this is not a random quip, parts of the book strongly harked back to Stross’ Accelerando - not a bad thing at all, in my opinion! So, get reading, it’s grand, and more is coming soon! 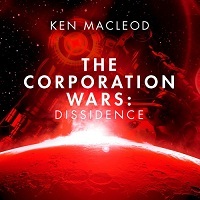 Ken MacLeod is a Scottish writer of SF who burst onto the scene with his Fall Revolution Series in 1995. He’s been nominated rather regularly for all the big awards, and has won the Prometheus (repeatedly), BSFA (also repeatedly), Sidewise, and Seiun in translation, obviously) Awards.